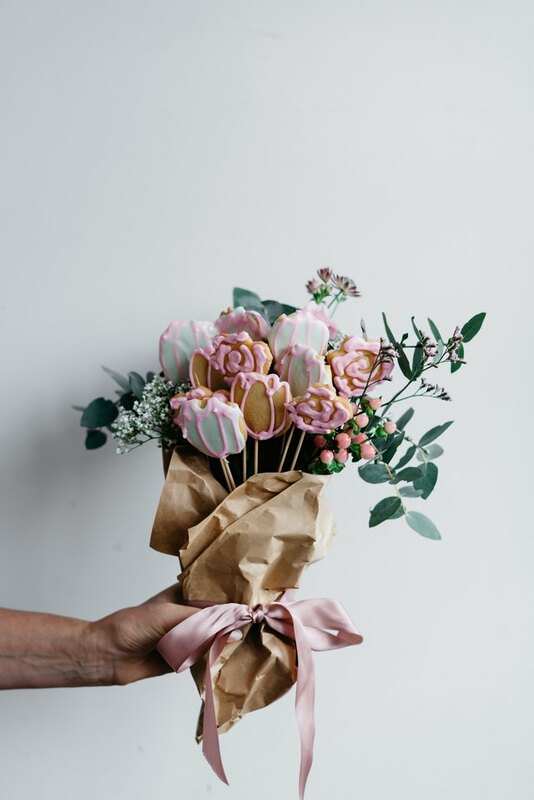 Everything is sweeter in bouquet form! 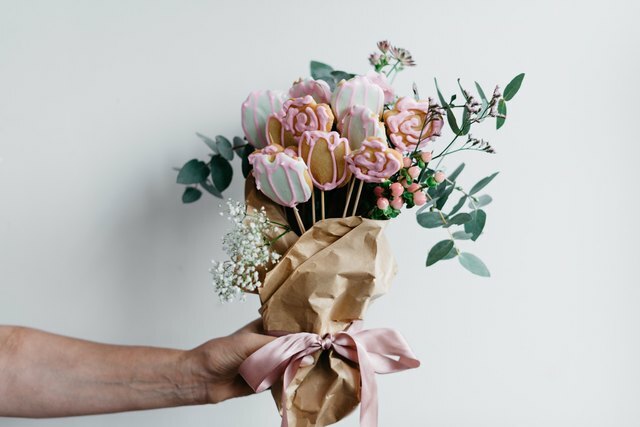 This edible sugar cookie bouquet is so simple to create and is the perfect sweet gift. 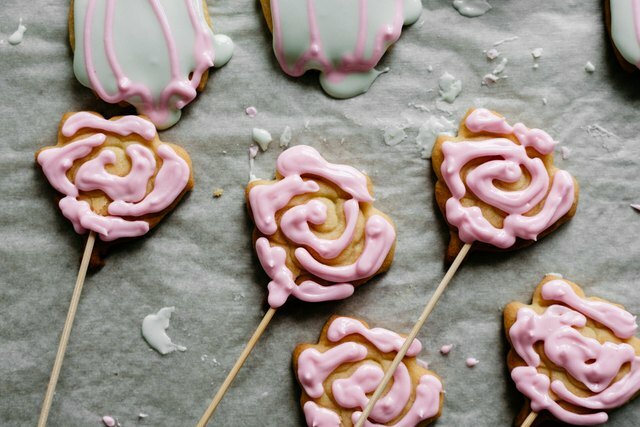 The cookies are a simple vanilla roll-out cookie glazed with a pretty, pastel-hued royal icing and decorated with flowers! It's perfect for spring or for Mother's Day. It's just as delicious as it is gorgeous, too! 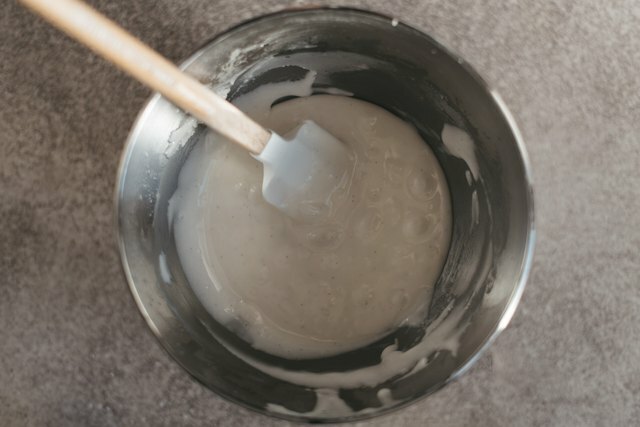 In a large mixing bowl, whisk together the all-purpose flour, baking powder, baking soda and salt. Set aside. In the bowl of a stand mixer, beat the butter and granulated sugar together on medium-high speed until light and fluffy, about 3 to 4 minutes. Add in the whole egg and vanilla bean extract. Beat until well combined, two more minutes. Add in the dry ingredients and beat until just combined. Remove the dough from the bowl and cover in a layer of plastic wrap. Set aside in the refrigerator to chill for at least two hours or overnight. Pre-heat the oven to 350 degrees F (180 degrees C). Line a large baking tray with parchment paper. Set aside. 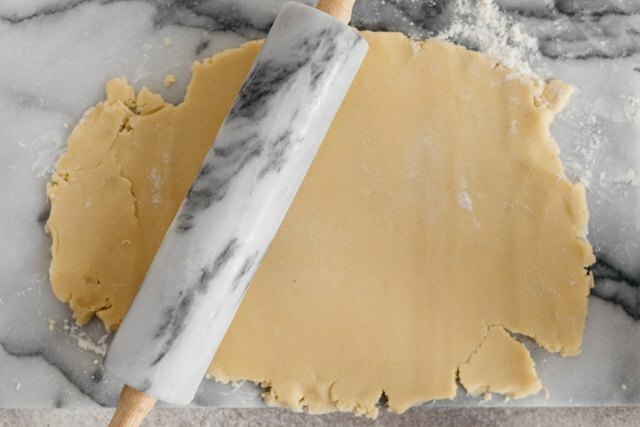 On a lightly floured surface, roll the dough out into a rough rectangle, about 1/4 of an inch (0.6 centimeters) thick. 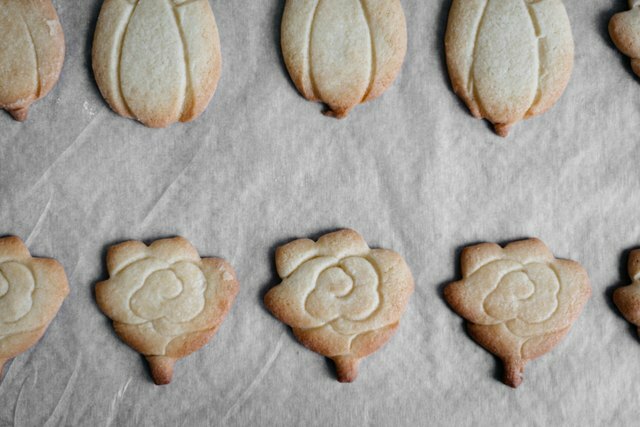 Using the cookie cutters, cut out as many shapes as possible out of the dough. 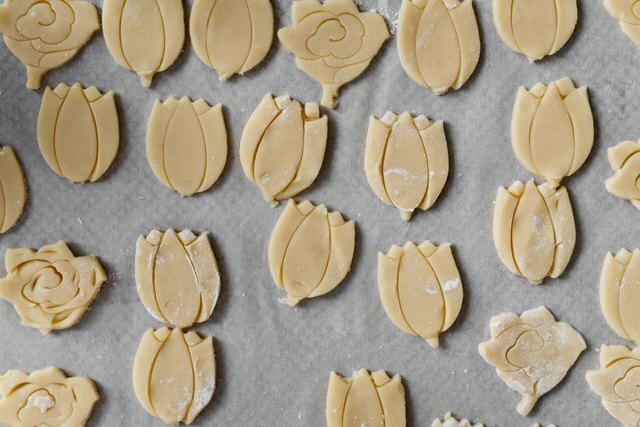 Re-roll the dough scraps into the same thickness and again, cut out as many shapes until the dough is all used up. Set the shapes aside on the baking tray, making sure to allow room for spreading. Bake the cookies, for 7 to 12 minutes, or until the cookies are just beginning to take on some color and are firm around the edges. Remove from the oven and immediately insert the wooden skewers into the middles of each cookie. Leave the cookies to cool completely, about 30 minutes. In the bowl of a stand mixer, combine the powdered sugar, egg whites and cream of tartar. Whisk, on medium speed, until just beginning to combine. Add in two teaspoons of water. Whisk to combine. At this point, judge the consistency of the royal icing. You want it to be fluid but firm enough to be able to pipe on-top of the cookies. If it is too thick, add an extra teaspoon of water at a time to thin or if it is too thin add a teaspoon of powdered sugar until it has slightly thickened. 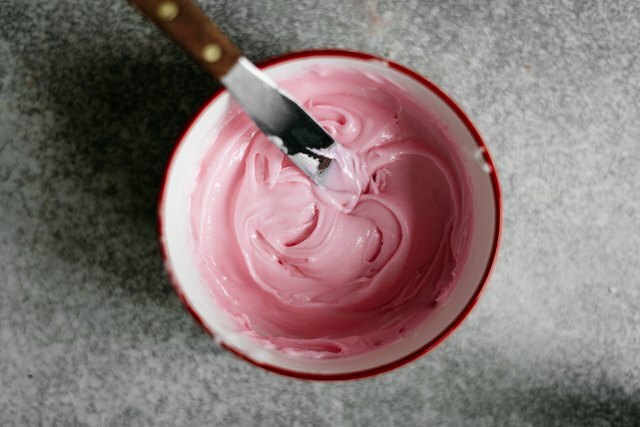 Divide the icing between two small bowls. Add one drop of food coloring into the first bowl and mix until evenly combined. Add another drop of food coloring into the second bowl and again, mix until evenly combined. Place each colored icing into a piping bag fitted with a small tip. Set aside. If you do not have access to a piping bag or piping tip, you can place the icing in a small zip-lock bag and snip off the tip for a similar effect. Pipe the royal icing over the tops of the cookies, alternating colors and decorating styles. Tie your sugar cookies together with some kitchen string. Add some fresh flowers (if desired) and a pretty ribbon then use some brown paper to wrap the bouquet up! Gift and enjoy your edible sugar cookie bouquet! The cookies can be stored in an airtight container for up to three days.